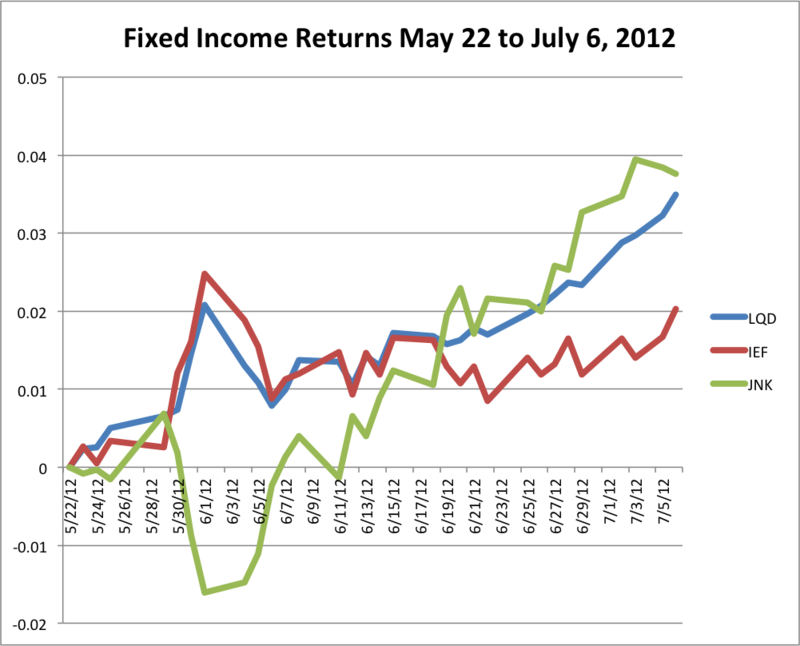 While equities have certainly entered summer doldrums, bonds have recently mounted an impressive rally. It's no surprise at this point that high-grade corporates are very popular for fixed income allocations since they are one of the few remaining bastions where one can obtain an inflation-beating yield. Since the May 22 near term trough, high-grade corporates (as represented by LQD), high-yield corporates (JNK), and intermediate term Treasuries (IEF) have rallied 3.49%, 3.76%, and 2.03% respectively. I am choosing to compare LQD to IEF because they have similar durations, 7.69 and 7.55 respectively. 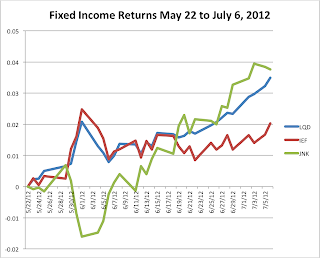 Though Treasuries have yet to reclaim their highs for the year (achieved on Jun. 1), high-grade corporates are looking at a multi-year high (the highest at least as far back as 2002). The correlation coefficient between LQD and IEF during the span between May 22 to July 9 stands at 0.737. Historically, for the nearly 10-year period from July 31, 2002 to July 6, 2012, the correlation coefficient between LQD and IEF stood at 0.952. The whole Treasury complex is quite richly valued at this point. Have we reached the point where high-grade complex are even more richly valued?